AMES, Iowa — Nearly half of Iowa farmers say in a recent Iowa Farm and Rural Life Poll that they are willing to plant monarch breeding habitat but are unsure how much land or money they would invest in the effort. Good monarch breeding habitat includes areas having milkweed for larvae and flowering plants that serve as energy sources for adults. Research at Iowa State University, conducted as part of the Iowa Monarch Conservation Consortium, is intended to provide information to help agriculture producers make decisions about this critical issue and encourage farmers to join the effort to reestablish milkweed and forbs that support monarchs during reproductive and late summer migrations across the state. 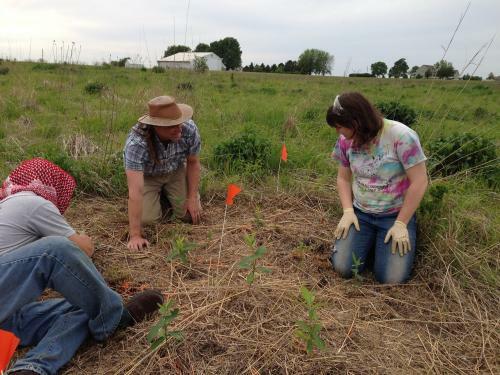 Teresa Blader, an Iowa State graduate researcher focused on monarch rearing, is completing her second year of research looking at optimal patch size, planting strategies that lead to best practices for establishing patches and appeal of different native milkweed species. She does a great deal of counting each summer – milkweed plants in a patch, eggs laid on plants, larvae feeding in patches and comparing the numbers from various sized habitat patches. Blader’s fellow Iowa State researchers are investigating milkweed species preferred by monarchs, monarch travel, how insects affect monarchs and monarch activity on sprayed milkweed. Iowa Monarch Conservation Consortium research has been conducted at all 15 ISU Research and Demonstration farms this summer and includes a comparison of the success of direct seeding to installing transplants. The Iowa’s Monarch Conservation Consortium, which includes the Iowa State researchers, will share recent data with Farm Progress Show guests visiting the Iowa State University exhibit Aug. 30–Sept. 1. They also will share progress toward developing practical and effective guidelines for farmers and landowners. Researchers and members of the consortium will be at the Boone, Iowa event to share research data and findings, and introduce visitors to monarch habitat plants and monarch life stages. Take advantage of the Farm Bill programs to establish monarch breeding habitat. Development of best-practices for conserving beneficial insects within Iowa's agricultural landscape.